Seal the freshness in by wrapping your meals with these Vacuum Sealer Rolls! With a total length of 15m, the 3 Pack Food Vacuum Sealer Rolls let you seal the goodness in into your meals or food without worrying about running out of wrap. The rolls are super easy to use, and just need you to cut them to size, throw in your food, and seal the edges using the Kogan Food Vacuum Sealer. 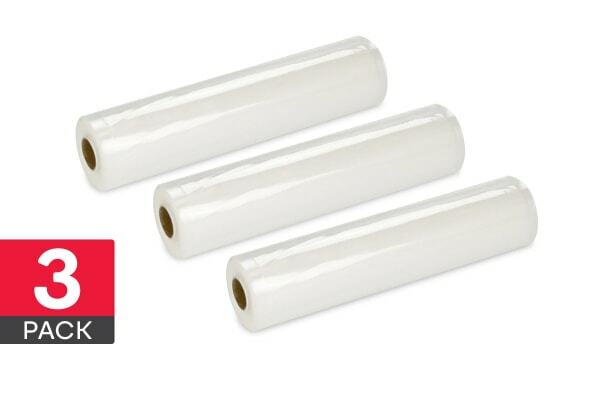 Being made with high-quality BPA-free PE nylon material, these rolls are food safe and even have micro-channels on the inside that allow air to be drawn out quickly for easy vacuum sealing. Your food stays fresher for longer as the soft material of the rolls wraps around it more tightly. What’s more, you can even safely boil, freeze, refrigerate or microwave your food in these bags!